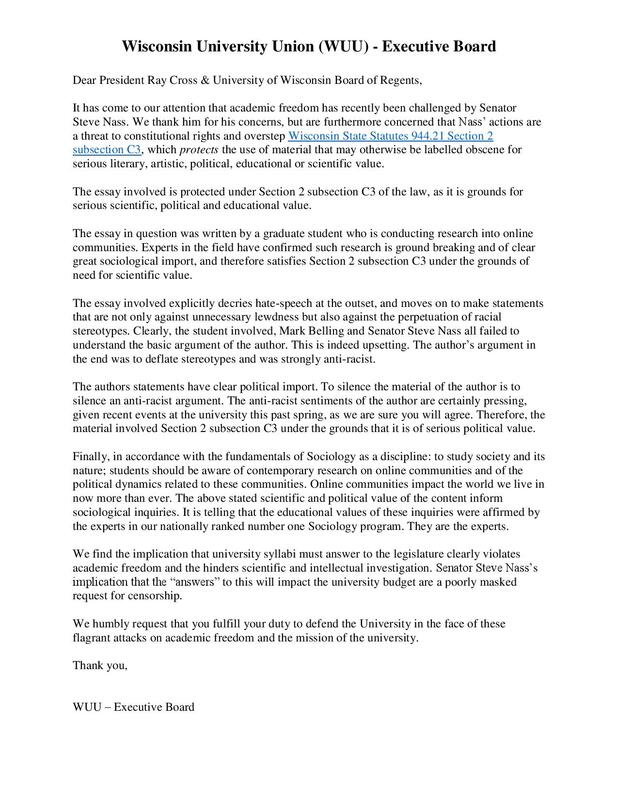 It has come to the attention of the WUU Executive Board that Senator Nass has recently sent a message to President Cross and the Board of Regents in an effort to restrict academic freedom at UW-Madison. You may read more about the story here. 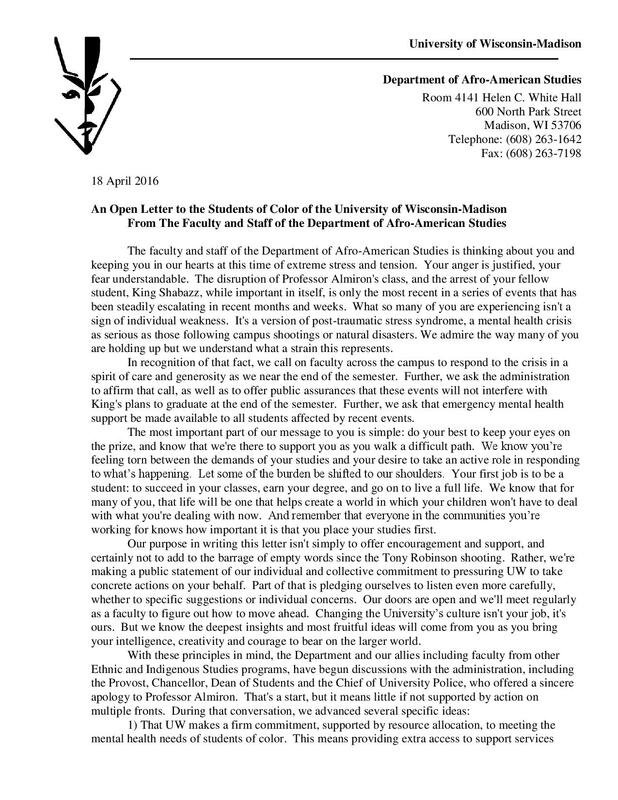 In response, the WUU Executive board has sent the attached letter to President Cross and the Board of Regents. We have attached that letter for your information. In the summer months it is important to remember…there is still no confidence in President Cross and the Board of Regents in Wisconsin. Please see our attached statement. You may be wondering whether you should support the proposed Faculty Senate resolution on No Confidence in the UW Board of Regents and President Ray Cross. 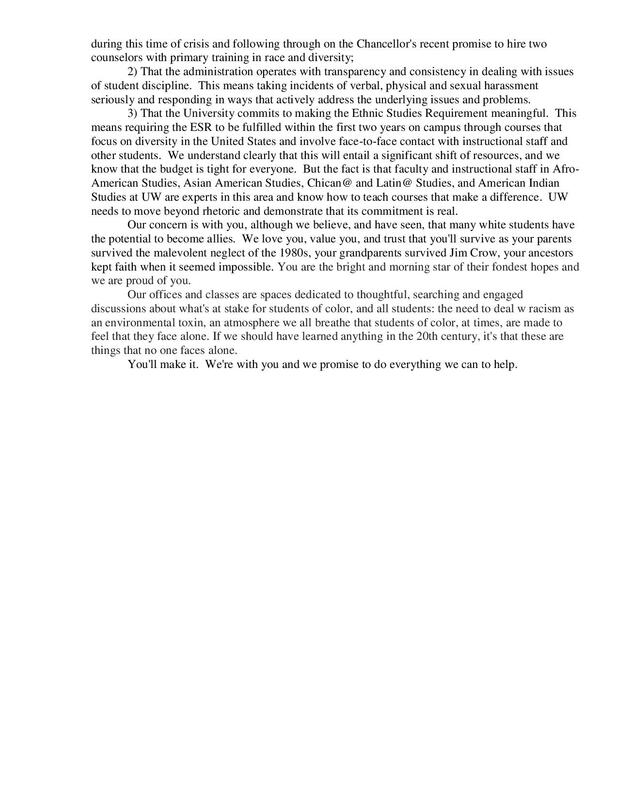 A copy is attached. FacultySenateResolution_20160502Mtg Below is a message from David Vanness citing examples from the last Board of Regent’s meeting to clarify why we should have no confidence in the Regents or the President to stand up for the welfare of the University, the students, the faculty and staff or the population of the State of Wisconsin as a whole. The Regents have facilitated the intrusion of Big Government into the management of the University. There are no-confidence resolutions under consideration on at least seven other UW campuses. We, the faculty, have lost governance power but, according to the new governance policy, we have the responsibility to advise on matters affecting the mission of the University. This resolution is part of our responsibility: alerting the population of the cavalier attitude of the Regents towards their job of protecting the educational quality of the University. As the President’s office said, this is a matter for the Faculty. 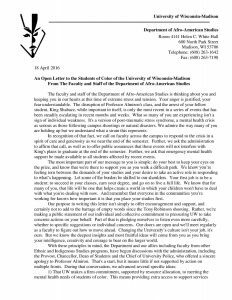 I am writing to you in my role as a fellow member of the UW-Madison faculty and not in my role as President of the local AAUP chapter. Our chapter is engaged in an ongoing, vigorous and respectful debate about the merits and risks of voting “No Confidence” in UW-System leadership. Eloquent and well-reasoned arguments have been made both for and against. However, two clear themes have emerged from our discussion, and I would like to share them with you. First, not a single member expressed that they are confident in President Cross or the majority of the Board of Regents’ ability (or desire) to protect UW System from continued budget cuts, program closures and faculty layoffs for reasons unrelated to educational quality. In fact, nearly all of us agree that they are at best complicit with our current state government’s desire to redefine the Wisconsin Idea as primarily a workforce training mission, and at worst actively engaged. 1:04:33 Regent Vice-President Behling and System General Counsel Tomas Stafford on why requiring alternatives to layoff to be “pursued” (instead of merely “considered”) would deny chancellors the “flexibility” needed to deal with budget cuts. 1:26:30 System President Ray Cross arguing that campuses will have flexibility in determining their own policy and that he hopes UW-Madison’s proposed policy (passed by the Senate in November) would pass. Of course, the Board of Regents went on to make significant amendments at its meeting last month, overruling the expressed sentiments of the Faculty Senate. 1:44:23 Regent President Regina Millner arguing that chancellors need flexibility to make certain “critical decisions” because faculty do not always understand the needs of the institution to have financial stability. Remember – this is a policy about program closure and layoff. 1:53:31 System President Ray Cross again emphasizing the broad nature of the policy to allow campuses the ability to draft their own policy. Also arguing that “financial issues” are inseparable from educational considerations. I believe that the cumulative effects of austerity are really beginning to be felt deeply across the UW System. 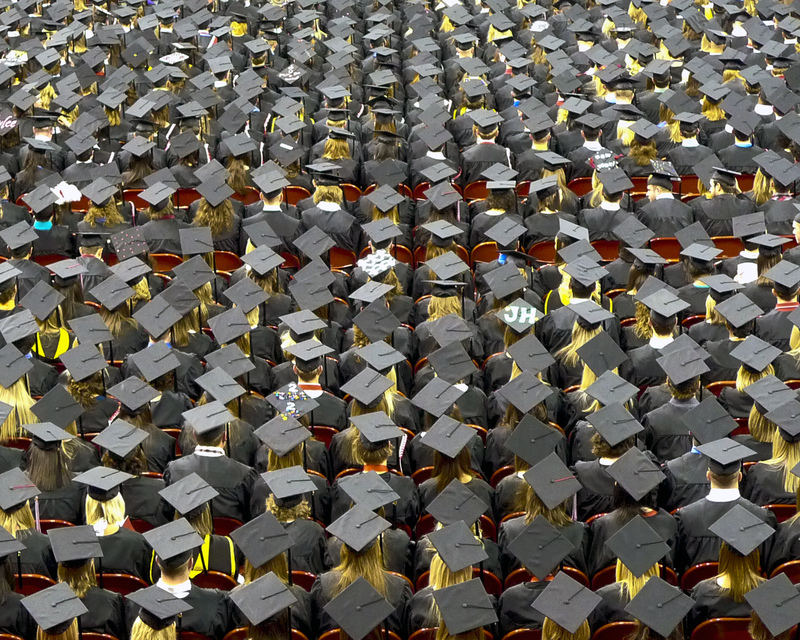 News articles are emerging from around the state that students aren’t able to get classes to graduate on time, that the classes they can get into are bigger and less personalized, that advising and other student services have been cut to the bone. President Cross, the Board of Regents and the State Legislature have made clear (no whining!) that they do not want that message out in the public. They do not want the citizens of the state to realize that the quality of our students’ education and our ability to attract and retain the highest caliber scholars and scientists has suffered under their policies. I would simply ask you to engage in the debate on Monday and vote your conscience. Whether or not you are confident in President Cross and the Board of Regents, in the true spirit of sifting and winnowing, we need to hear your voice and have your honest vote. If at the conclusion of the debate, you find yourself lacking confidence in our leadership, I would ask only one thing: be fearless. That’s the way by which alone the truth can be found. 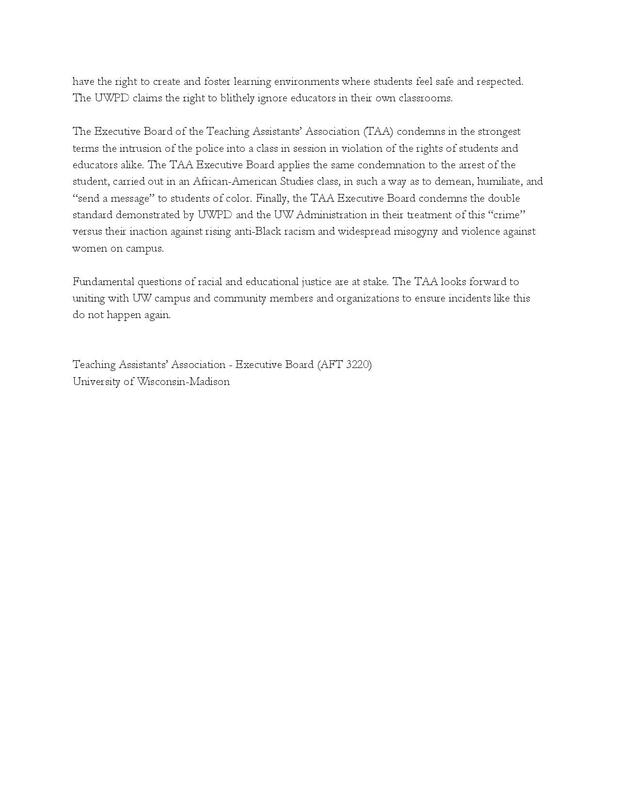 In the interest of promoting a safe learning environment for students, WUU Executive Board would like to help share the attached statements by the Afro American Studies Department and the Executive Board of the Teaching Assistants Association (TAA). We believe that it is the shared job of faculty and other community members to facilitate a supportive environment free of hindrances to instruction and learning. 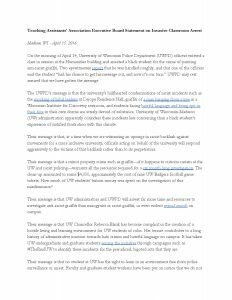 The Wisconsin University Union (WUU) commends the ad-hoc committee for the work they did to address their charge. The charge, when given, may have seemed appropriate as a rapid response to the changes due to Act 55. However, from discussions at the faculty listening sessions, it is clear that enacting a tenure policy based on that change is not in the best interest of the University. The measure of the value of tenure is not established through comparison to guidelines from the American Association of University Professors (AAUP) or to peer institutions but by comparison with what existed before Act 55. WUU urges the Faculty Senate reject the proposed revision to Chapter 10 and replace it with a proposal that addresses the issues below and those raised at the faculty listening sessions. 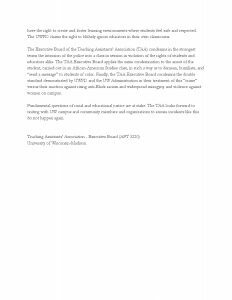 As noted by the UW-Madison Chapter of AAUP, Act 55 permits the State Universities to lay off tenured faculty for curtailment, modification or redirection of a program, but does not demand that policies include such possibilities. The ad-hoc committee noted that many programs have changed or been terminated in the past without eliminating faculty. That should not be changed simply because we are now allowed to do so. Since lay-offs and terminations have not been necessary in the past, they should not be part of program redirections in the future but only applicable for financial emergencies. “Programs” need to be defined to prevent administrators from defining programs as individuals targeted for removal. Program changes approved by the University Academic Planning Council as well as the results of a hearing for program changes or job displacement before the Committee on Faculty Rights and Responsibilities should be appealable to the Faculty Senate. 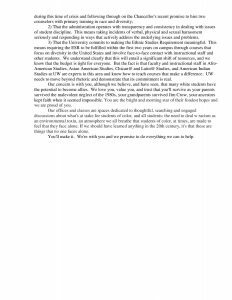 For any displacement of faculty, seniority should play an important part in which faculty lose positions and the policy should have explicit langue concerning seniority. Any policy must define all the relevant terms. Regardless of the policy adopted, the Faculty Senate should resolve to address job stability issues for University Staff. 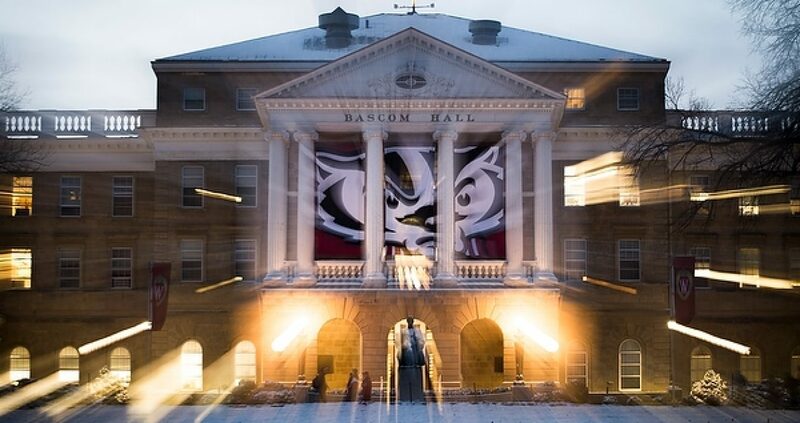 Please join with faculty, staff and students in defending academic freedom on our campus by signing this letter in support of Sara Goldrick-Rab, Professor of Educational Policy Studies and Sociology at the University of Wisconsin-Madison. 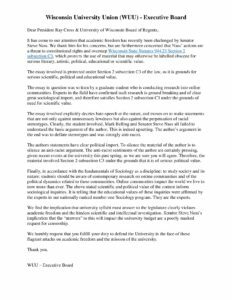 We, the undersigned, are deeply disappointed with the University Committee’s hasty and ill-conceived reprimand of Prof. Sara Goldrick-Rab on July 16, 2015. 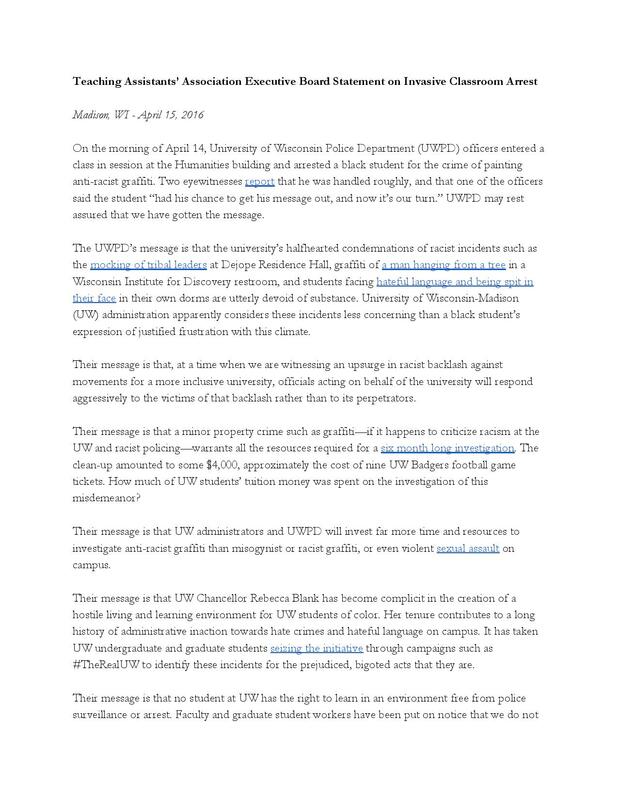 The University Committee does not speak for all Faculty Senators on this issue, let alone all faculty, and certainly not for university staff and students. Indeed, since you have singled out Prof. Goldrick-Rab for public reprimand without first discussing your concerns with her, without seeking the input of the Faculty Senators who represent the two departments with which she is affiliated, and without a vote of the Faculty Senate, it is not clear that you speak for anyone other than yourselves. It is the University Committee’s reprimand, not Prof. Goldrick-Rab, which is damaging the principle of academic freedom and the university. 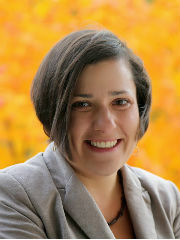 Prof. Goldrick-Rab has demonstrated her dedication to the University of Wisconsin on many occasions. If the University Committee wishes to encourage the fearless sifting and winnowing on which the great state University of Wisconsin once prided itself, then you should retract your statement and apologize to her. We urge you to do so. 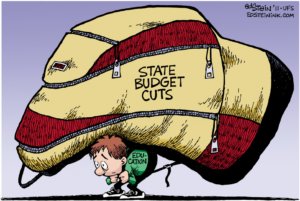 Find more information on Professor Goldrick-Rab’s actions and the University Committee’s attack in Inside Higher Ed, in the Student Activism blog, and even from political cartoonist, Mike Konopacki. Senator Bernie Sanders’ (Independent, Vermont) entry into the 2016 Democratic presidential race has introduced a fresh voice on higher education. On May 6, 2015 Bernie Sanders introduced legislation to break up any too-big-to-fail financial institutions. He argues that using taxpayer funds to bail out failed financial institutions after Barak Obama became president in 2008 increased the gap between America’s richest and poorest. He believes that right now the six biggest banks in the US still have too much control over the US economy. They need to be broken down into smaller banks that are NOT too-big-to-fail … to be bailed out once again by taxpayer funds. On May 19, 2015 Bernie Sanders introduced the “College for All” Act. He believes that free higher education for those who qualify and so desire should be a citizen’s right in the United States (as it is in countries like Denmark). Bernie Sanders is appalled by the current estimated $1.3 TRILLION student-loan debts and accompanying years of so-called postgraduate “indentured servitude.” Furthermore, he has identified a source for funding the “College for All” Act. The needed funds could be generated by a 50-cent tax on every $100 of stock trades and stock sales in the United States. This tax has been nicknamed the “Robin-Hood tax,” since it takes from the rich and gives to the middle classes and the poor. If approved, the “Robin-Hood tax” would be a relatively simple tax to collect. Moreover, it would generate massive amounts of money taken from the middle of Wall Street’s everyday activities. Bernie Sanders agrees that college is not for everybody. But he believes that every US citizen who wants a college education and is qualified for admission has a “right” to attend college. 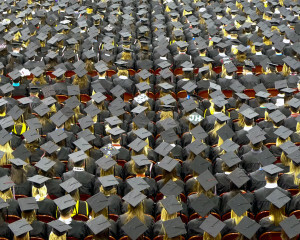 The passage of the “College for All” Act could be a significant step toward re-distributing America’s wealth, re-energizing America’s poor and middle classes, freeing college graduates from years of college-debt and “indentured servitude,” and shrinking the gap between the poorest and richest citizens in the United States. See the summary of Sen. Sanders’ College for All Act Here.